Crusher Jerry Blackwell, a 400-pound wrestler who gained notoriety during the ’80s as one of the top heels in the now-defunct AWA, has passed away at the age of 45. Blackwell, who during his prime in the early ’80s was considered one of the most talented big men in the business, retired from active competition in 1988 due to declining health and had suffered from diabetes, gout and gangrene in recent years. He died, however, of complications from pneumonia stemming from a December car accident. 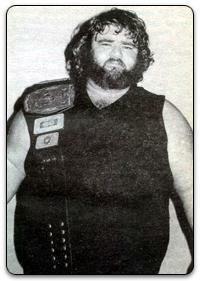 Billed as the man mountain from Stone Mountain, Blackwell was a top draw due to his size, ring ability and interviews. His ample girth was even more pronounced due to his short height (5-9) and an enormous midsection. But his agility and stamina allowed him to work longer and better matches than most of the big men of that era, and he was able to perform such moves as standing dropkicks and was able to take bodyslams and suplexes. [ad#MikeMooneyham-336×280]Blackwell began his career in 1974 in his home state of Georgia, but he made his mark on the business when he joined Verne Gagne’s American Wrestling Association in 1979. He enjoyed a successful run in the AWA that was marked by money-making feuds with such stars as The Crusher (Reggie Lisowski), Verne and Greg Gagne, Brad Rheingans, Stan Hansen and Dino Bravo. His brutal mid-’80s feud with the late Bruiser Brody drew national attention and a number of sellout crowds. Blackwell, as Sheik Ayatollah Blackwell, held the AWA tag-team title with Sheik Adnan El-Kaissey in the early ’80s and later teamed with Ken Patera to win the tag-team belts from Greg Gagne and Jim Brunzell. With El-Kaissey as their manager, the two held the tag straps for more than a year before dropping them to The Crusher and Baron Von Raschke in 1984. Blackwell, who also held the prestigious Missouri state title on two occasions from 1983-85 with victories over Kerry Von Erich and Harley Race, returned to Georgia in the late ’80s to promote for an independent group, Southern Championship Wrestling, that ran shows in the Atlanta area. Blackwell, however, battled with many personal as well as health problems outside the ring. He went through a divorce following the death of his son, lost his business and was plagued with various illnesses during the last few years of his life. Estranged from his family, Blackwell had survived a near-fatal bout with kidney failure and pneumonia, and had been involved in a series of auto accidents. Blackwell, who had been living in Dawsonville, Ga., the past several years, was buried in Atlanta.